The W.A.G.RYS had a total of about 149 class B cattle trucks of at least four different designs. The first group consisted of only ten wagons although it is possible that there was more than one actual design in this group of early stock as two different diagrams are known. These wagons were 17'-0" over headstocks and originally had bell buffers. The first four were built in 1885 (107-110) with a second batch of four in 1888 (178-182) and a final two? (36 and 37) in 1891. 178 was gone by 1900. All of this group were written off by 1903 although 107, 110, 180, and 182 survived to become Jetty wagons 257, 256, 263, and 264 respectively. 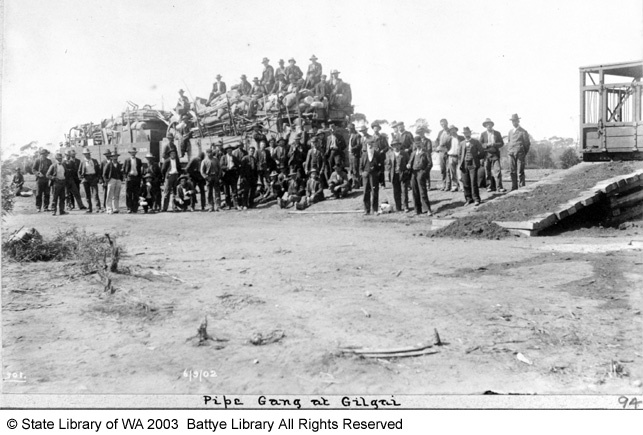 The picture at right is a detail from Battye library image 011078d taken at Gilgai in 1902. 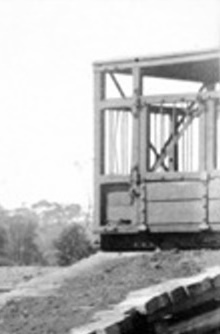 This wagon corresponds to a diagram showing a wagon with two sets of doors. There is another diagram with only one set of doors in the centre of the wagon so these first ten wagons might be of two types. Unfortunately no number is visible in the photo. An old photo of Albany showing (amongst other things) four GSR cattle wagons in their pre-1896 livery. It is just about possible to recognise the words GREAT SOUT HERN RAILWAY at the top of the sides in white. A second group of wagons of an altogether different design were inherited by the W.A.G.RYS when the G.S.R was taken over in 1896. They are believed to have been similar to the MRWA C class cattle trucks. They were much shorter than the W.A.G.R. wagons being only 14'-0" long and were numbered 4358 - 4381 by the W.A.G.RYS with 4362 and 4381 being converted to D class goods vans before 1900. 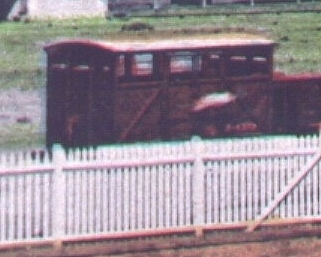 The above image is enlarged from an old coloured postcard and shows one of the GSR B class cattle wagons at Wagin. However this is not the whole story. Usually a wagon would not be expected to have a life of more than about 30 -40 years, even on the W.A.G.R. so the question arises as to whether these wagons were reconstructed or replaced at some point between about 1900 and 1925. It seems likely that this was the case with replacements being to the standard design on the GB underframe listed below. Confirmation of this for at least one wagon is given by the enlargement below of an old postcard of Albany which dates to some point between 1928 and 1942 showing B436? where the last digit is present but impossible to make out . It now seems likely to me that the GSR cattle vans were replaced by new standard B class wagons at some point between 1900 and 1916 (when construction of class BD started). The fourth group used the GB type 15'-0" wooden underframe. 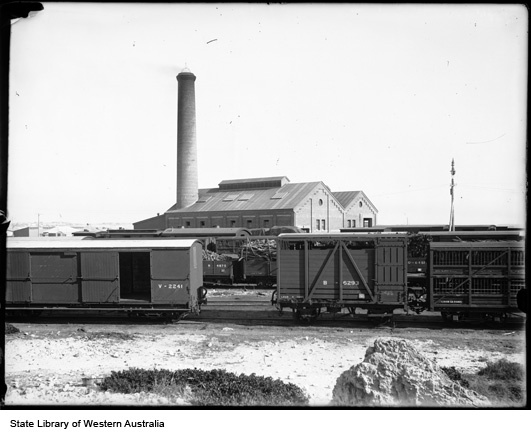 Battye library photo 10006PD has a nice clear view of B6293 in front of Fremantle power house. The body work appears to have been almost identical with the previous group. These wagons were numbered rather haphazardly as some were given numbers vacated by scrapped wagons. 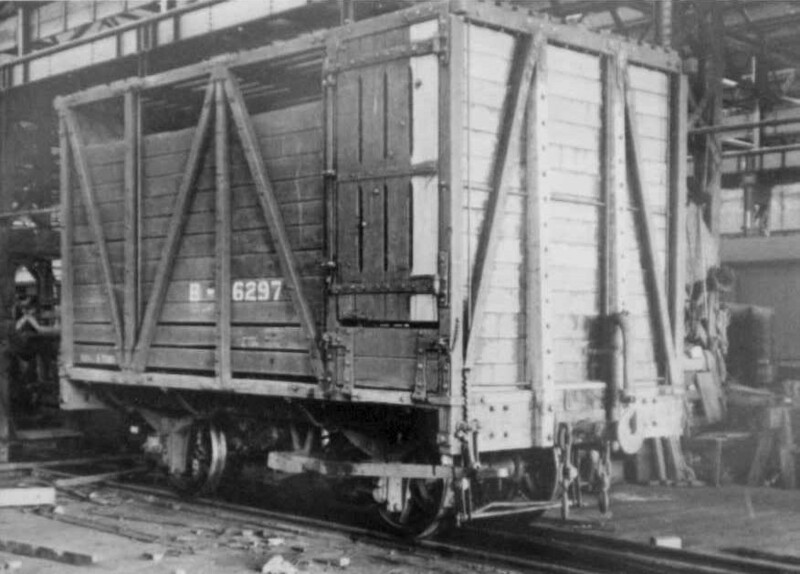 Three wagons (6300, 6313 and 9740) became elephant vans in 1929. The final group of class B cattle wagons was 10107-10116, which were new 16'-0" long vehicles built in 1916. They were the first vehicles in what was to become class BD to which they were reclassified in 1920. 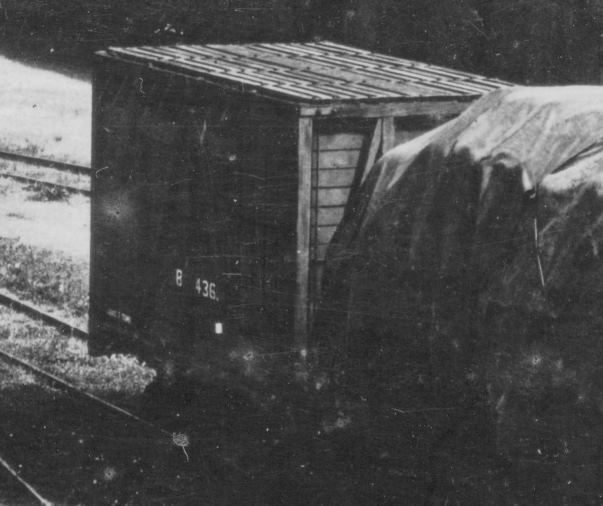 One A class horsebox (A5142) was briefly included in Class B when it was converted to a cattle wagon in 1936. In 1937 it was then reclassified BS. The W.A.G.R. 's other cattle trucks were classes BD, BE, BS and the bogie vehicles in Classes T, TA and TAD.